Microsoft Dynamics 365 includes capabilities such as financial management, manufacturing, retail, business intelligence and reporting, supply chain management, and human capital management. MS Dynamics NAV is a complete ERP solution with a difference. Easy to learn, simple to use and quick to implement. With integrated financial, manufacturing, supply chain management, sales and marketing, project management, human resources and services management information from across your organization stored in a centralized database. Powerful application functionality like Cash Flow Forecast, Cost Accounting, Assembly Management, Timeline Visualization, and other capabilities like improved query and charting enhance data access, analysis, and presentation for more users. This fosters deeper insight into the operations and processes that drive your company, helping you to gain greater control. Improved margins can follow when you empower more of your people to work more efficiently and productively. 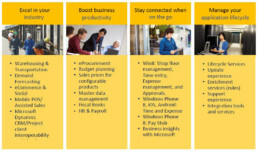 Exciting new features and enhancements like Microsoft Dynamics NAV 2013 web client, SharePoint client, refined RoleTailored capabilities, and increased general ledger flexibility extend the power of Microsoft Dynamics NAV 2013 throughout your organization. Faster time to value is possible because it’s easy to learn Microsoft Dynamics NAV 2013 and get it installed and running quickly, whether you deploy on-premises or in the cloud. Upgrade to the latest technology to increase the productivity of your team. Get more out of your IT investment. Chart a technology roadmap that keeps your business on the forefront of innovation. Over 70,000 customers worldwide rely on Oracle’s complete application solutions to achieve superior results. Zerone being ORACLE GOLD Partner has all the expertise on Oracle Applications and Technology products. Oracle E-Business Suite is the most comprehensive suite of integrated, global business applications that enable organizations to make better decisions, reduce costs and increase performance.